The 2013 LD-CAP flight tests were conducted in North Dakota from 15-20 July and in Virginia from 5-9 August. These test flights examined three different algorithms (UND, MITRE, and Draper). 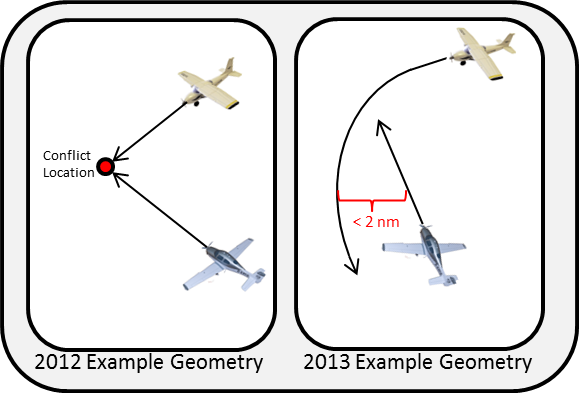 All algorithms commanded maneuvers to the autopilot and successfully guided the surrogate UAS away from potential conflicts. 134 encounters were flown in North Dakota and 91 encounters were flown in Virginia. These encounters were all 1v1 and involved a mix of basic encounters (same encounter geometries that were flown in 2012) and more advanced encounters (which included the intruder target maneuvering into a potential conflict situation). During the Virginia flight tests, algorithms were tested using ADS-B, ADS-R, and TIS-B data, as well as a theoretical data source comprising of ATC primary radar returns that are re-broadcasted through the ADS-B data stream (pTIS-B). These tests were successful as each algorithm triggered on each of these data sources. Invited media and distinguished visitors had the opportunity to get a detailed view of the operations at each location. These guests included the president of UND, congressional staff members, a member of the ND House of Representatives, members of NASA, and members of multiple media groups.